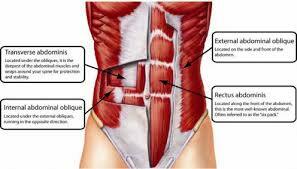 Transverse abdominis muscle (TVA) is right under your rectus abdominis or the "six-pack" muscles. It is an important muscle but unfortunately, many people put their emphasis on six-pack abs only and ignore the fact that they need to work the transverse abdominal muscle as well. Without developing the TVA, it is actually not possible to make your six-pack visible. It is important to strengthen the TVA because it serves as your body's natural girdle and keeps you from dealing with a sagging belly. Thankfully, you can find many exercises to target this muscle and improve the overall look of your body. Paying attention to the transverse abdominis is important because this muscle group is important for stabilizing your pelvis. It also protects your back and makes it easier to maintain a good posture. Here are some simple yet effective exercises to target the TVA. It is one of the simplest ways to strengthen the TVA. Here is what you have to do. Simply lie on your back and bend your knees. Now, exhale and pull your belly in toward your spine. Be sure to hold the contracted position for a couple of seconds and then slowly return to the starting position. It is yet another great exercise to target the TVA because the move can actually isolate this muscle group. Lie flat on the floor and bend your knees. Keep your feet flat on the floor with your arms at your side. Now, lift your hips off the floor using your abdominal muscles. You should be pulling your hips toward your ribcage. Be sure to use your abdominals to stay in control of the movement. Maintain the contracted position for a few seconds and then slowly lower your body. Using planks is one of the best transverse abdominis exercises because they target a variety of muscles in the TVA. Start by getting into push-up position. Now, shift your weight on your elbow and toes. Ensure that your arms make a 90-degree angle to the floor. With your elbows underneath your shoulder, maintain this position for as long as you can. Be sure to use your abdominal muscle to maintain the position. Never round your back. Again, including medicine ball in your routine can shift focus to your transverse abdominis because you need more strength to stabilize your core. Lie on your back with the medicine ball in your hands. Now, move your hands above your head. From this position, use your abdominal muscles to lift your hands and legs off the ground. Be sure to contract your transverse abdominis as much as possible. Now, slowly bring your knees toward your chest and try to bring your hands forward until the medicine ball is about to touch your knees. Ensure that your spine stays in a neutral position all the time. Maintain this position and then return to the starting position. You can perform this exercise without any equipment and still target the TVA in a good way. Lie on the floor with your feet flat on the ground. Bend your knees. Simply bring your torso up towards your knees while tightening your core. Be sure to move slowly to take momentum out of the picture. Never try to pull on your neck to move your torso up. Perform 3 sets with 15 reps per set. Another great way to make the TVA work is to include exercise bands in your routine. These bands help increase resistance and make it easier to target the TVA. Take an exercise band and attach it to a high structure. Get on your knees and hold the band in your hands. Now, bend your torso using your abdominal muscles. Keep bending until your head is about to touch the ground. Feel the contraction in your abdominal muscles and then slowly return to the starting position. It is one of the best transverse abdominis exercises because it helps isolate the TVA. Take the Swiss ball and keep your forearms flat on it. Now, keep your lower legs and knees planted on the ground. Maintain this plank position for as long as you can. You can roll the ball a little to make your core work even more to keep things stable. The best thing about this exercise is that you do not have to worry about putting too much pressure on your lower back. You can try this exercise to isolate your transverse abdominis and get better results. Start by lying on your back with your feet behind your buttocks and knees bent. Tighten your stomach muscles by drawing your abdomen into your body. Do not let your back leave the ground. While staying in this position, raise the middle part of your body. Ensure that your shoulders and upper back stay on the ground all the time. Squeeze your abs hard to maintain the position. Return to the starting position after 10-20 seconds.